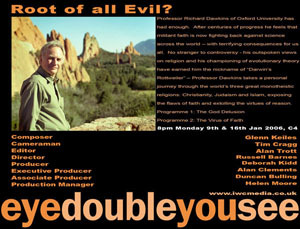 AKA "Religion With Richard Dawkins", IWC's series "Root of All Evil?" required precisely researched photos and footage that would illustrate the scientific arguments in favour of Darwin's theory of evolution and challenge the rise in 'fundamentalist' God-as-Designer creationism. Zooid have had extensive experience in illustrating such subjects, thoroughly grounded in our work for the entire school science curriculum (for several school book publishers) as well as a good grounding in genetics, evolution and DNA. But in this series, Dawkins spread the net to include religious ritual, aids, miracles, astronomy, Israeli-Palestinian Wars, sharia law, religious education, modern terrorism and evangelism.